Often it is difficult to find the perfect “gift” for the angler on your list. We can help! A LakeLady Gift Certificate is the perfect solution. 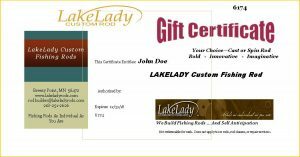 The LakeLady Gift Certificate allows the angler and the builder to collaborate to build exactly what is desired for this truly unique gift. Your thoughtfulness for something as personal as a LakeLady custom fishing rod is certain to be appreciated. The LakeLady Gift Certificate will arrive in an envelope personalized with all the necessary information to make the proper contacts and get the rod building process started. Your gift will be treasured for years to come and will continue to give pride of ownership that exceeds all proportion of cost.